NOTE: This was originally published as six separate issues. A second edition was published in 1982 in three spiral-bound volumes. 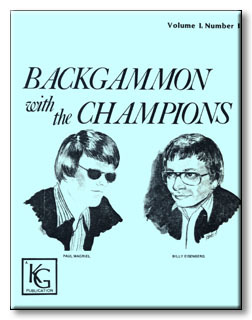 Number 1: Paul Magriel vs. Billy Eisenberg: American Open Backgammon Championship, Las Vegas, Nevada, November 1979. Round 4, 15-point match (iv+42 pages). Number 2: Bill Robertie vs. Mike Senkiewicz: Las Vegas, December, 1980. Semi-finals, 19-point match (iv+76 pages). Number 3: Stan Tomchin vs. Chuck Papazian: World Championship, Monte Carlo, July 1981. Second round, 19-point match (vii+62 pages). Number 4: Joe Dwek vs. Ralph Chafetz: Turnberry Isle, Florida, February 1981. Third round, 17-point match (vi+61 pages). Number 5: Erik Seidel vs. Al Hodis: Black and White/B.S.O. Boston Tournament, April, 1980. Round five, 17-point match (xii+51 pages). Number 6: Kent Goulding vs. Michael Maxakuli: Las Vegas Holiday Tournament, December 11, 1981. Round four, 15-point match (viii+54 pages). Annotation in collaboration with Kit Woolsey. AUTHOR: Mr. Goulding is acknowledged as one of the world's finest backgammon players and instructors. He has won many major tournaments, including the 1977 Tournament of Champions, Paradise Island, the 1978 Florida State Championship, the 1979 Maryland Open, the 1980 Washington Black and White Championship, and 1981 $1,000 Jackpot Tournament at the Desert Inn in Las Vegas. He has won five doubles tournaments, most recently the 1980 U.S. Open Doubles Tournament in Clearwater, Florida. Kent has authored many articles in leading backgammon magazines, and is well known for his entertaining, yet instructive style.